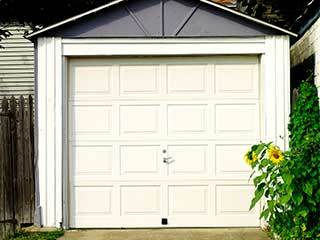 With a little bit of vision and the right materials, your garage door can add to your real estate value. Just make sure it fits the look and color scheme of the rest of your property, and that you don’t interfere with its functionality too much by adding the wrong kind of paint or badly placed decorations. Here are some things to think about. Before you start decorating, think about the overall look of your garage, house and street. What color (or combination of colors) would compliment it? You don’t want a decoration scheme that sticks out like a sore thumb, but you also don’t want your garage to just fade into the background, that would defeat the entire purpose. Decide what you want to do before you start buying supplies. If your garage door panels are made of metal, they’re liable to expand and contract as the weather changes – this can crack most paints. You’ll need to liberally apply a heavy, latex-based paint in this case. If you have plastic or wooden panels, a thinner paint should suffice, but be wary of how it might get scraped off when the door opens and closes. In either case, be very careful not to get too much paint inside the hinges or at the panels’ intersection points, or you may clog these components, affecting their functionality. You can find a wide variety of decorative handles, knobs and other ornaments at a local retail shop or by shopping online. The trick here is to decorate your door without overdoing it and making it look too gaudy, as well as picking ornaments that match your desired color scheme and general aesthetic. Of course, you'll also need to make sure that you don’t attach anything that will get in the way of the door’s opening and closing; look at how the panels move very carefully before you make plans. For more advice on garage door repair issues and upkeep, contact our professionals in Clermont.